Elections, voting and selecting or choosing candidates, approaches to addressing issues, and deciding questions of governance. We want government representatives to cover all viewpoints of their constituents fairly. Advocates for racial representation try to segregate those of a particular color or race so that they can have their own representation. Is it truly better to have a district with boundaries drawn so that a majority race or majority color can be constructed from adjacent districts that otherwise would claim those minorities? Which groups or divisions of people are acceptable to create such a minority district from, and must it also be relatively contiguous geographically? Is it solely color of skin, or should all physical, mental, ethnic and cultural differences be accounted for separately in representation from districts? If Italians and Irish are commingled in two adjacent districts, is it better to divide the two national-origin groups by gerrymandering the boundaries so that there is a more exclusively Irish district and a more exclusively Italian district? Or, should we simply draw compact and contiguous districts regardless of the relative proportions of Italians and Irish? If Jews and Christians, similarly, are intermixed geographically, should we re-draw boundaries so as to give a district with primarily Jewish constituents in one or more districts while drawing the boundaries to concentrate Christians in the remaining districts? How far should we take this objective of drawing boundaries to create a majority constituent group? Should we segregate constituents by gender identity issues? Maybe English- from Russian-speaking from Chinese-speaking? Where does this divisiveness stop? To unite people, we divide them. That’s logical. We don’t try to see past differences – we focus on them. We don’t try to find common ground – we seek confrontational divisive politics. Those district judges “know” that if you have the same skin color as someone else, you want the same things and you vote the same way. They’re not prejudiced at all. And their views unite us all. In democratic government power is wielded by those voted into power. Changes in the law, like Constitutional amendments and plebiscites also are voted on. Voting is a crucial element of practicing democracy in a republic. Decisions are bought into by the voters primarily by majority voting. Counting ballots usually reveals that only a small portion of citizens eligible to vote actually show up to vote. The fact that many voters disenfranchise themselves is appalling. It is also appalling that, although eligible to become voters, many citizens simply fail to register to vote. Between these two appalling facts of failing to register and failing to vote we find that only a small fraction of the voting-aged population actually exercises their right to vote. Worse, decisions are almost always determined by the largest number of votes received on an issue. A plurality is a pitiful way to decide things, especially considering the appalling facts above. With 3 choices available, if 40% favor choice A, 35% favor B and 25% favor C, A will win. Even though A has only a plurality, it will be the official outcome. To put this in perspective, typically only 60% of the voting-aged population bothers to register to vote. In a typical election only 20-40% of those registered show up to vote. This means that tiny fraction of voters (12-24%) can determine the outcome, perhaps only 40% of 20% of 60% of voting age people. In a close race only half of 12% wins, maybe less. How can only 5% or less determine an election? Sometimes it’s just laziness: the voter moved and didn’t re-register in the new voting precinct. Sometimes it’s to avoid jury duty, since often jury pools are selected from voter registries. Often eligible citizens don’t know the process or the place to go to register, and then it takes a while to get around to it. What do we imagine the 5% or less that vote for choice A B or C know about the 3 choices and how informed they are to choose? Are they party-line voters, do they recognize the name of a candidate, or did they see a political advertisement that swayed them? It should be obvious that having a cadre of informed voters who show up is essential to having good election outcomes. When a few votes out of 5% are fraudulent, it can alter the election outcome to become fraudulent, too. We cannot allow votes to be bought, to be stolen or in any way to be fraudulently or forcibly cast. We simply cannot afford to waste even a single vote. Since the democratic process runs on votes, the notion that votes are the currency of democracy is correct. Counterfeit currency steals value from other currency-holders. Counterfeit votes steal outcome from real voters. 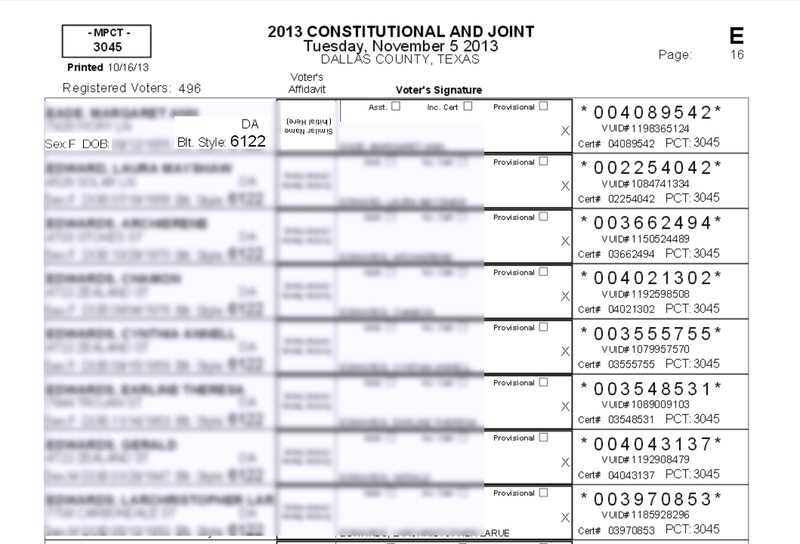 A voter’s wishes are diluted by the presence of fake ballots in the ballot box. Fake ballots are those created by someone without counting them as coming from a legitimate voter. In the past this illegitimate practice was called ballot-stuffing. Currency stolen from its proper owner, whether the owner is aware of it or not, is still theft. Stealing a vote is a matter of attributing a ballot to a particular voter (who didn’t vote). These stolen votes are based on fraudulent identity, and steal the power of the legitimate voter, even though the voter may not know about the theft. When ballots are accounted for and handed out only to registered voters, only fraudulent identification of a registered voter will result in theft of vote. Theft and loss of votes can also occur later during the canvassing of ballots. Ballots could be miscounted, could be discarded unintentionally or intentionally, or could simply be misreported. Trusting officials to safeguard ballots and to count them all properly forces us to design voting systems that can be trusted, typically by re-counting by separate mechanisms and different people and cross-checking the result or allowing audit of votes afterwards. In an ideal voting system ballots would be intact from casting to canvassing with the ability for audit by officials and for voters to verify their individual ballots were counted and no others recorded in their names. But all systems rely on authenticating a person claiming to be eligible as a voter. 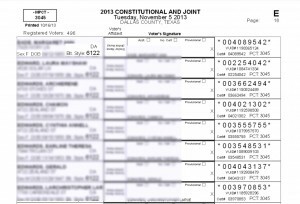 It’s one thing to force everyone issued a ballot to dip their hand in indelible ink so we know only one ballot was issued, but how do we know if they’re eligible at all? We adhere to the principle “One Man, One Vote” meaning you can’t vote twice for Governor or twice for President and so on. But, we also mean that Green Party members can’t vote in the Socialist Party primary election, and citizens in one county can’t illegitimately vote for county issues in another county. Proving that a voter is actually eligible to vote is crucial. Today only citizens may vote and residence is used to determine where they vote. Registering to vote allows an agency of the government to vet the person for citizenship, record any identifying information, confirm their taxpayer status, and issue a voter card. In an ideal voting system every citizen eligible to vote would be able to register to vote nearly instantaneously. This would allow the ‘green’ eligible area to be equal to the ‘blue’ registered area show in the graphic above. Voting more than once can be detected by tracking when a person votes and having all other places or methods to vote precluded by that detection. If I vote for President in precinct 123, as soon as I cast a ballot for President, all other precincts know about it and I cannot go to another precinct and vote for President again. My vote is tied to my identity. 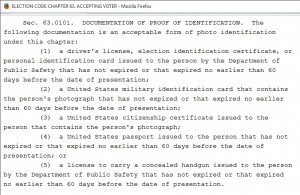 If I can be uniquely identified, then duplicate votes can be stopped for me (if my identity is confirmed every time I attempt to vote). Of course not only must other precincts be allowed to see I have already voted but other methods, such as early voting and voting by mail, should be checked before issuing a ballot to me and they should also be allowed to see that I have voted. Those other locations must be allowed to see the issuance as quickly in real time as possible – if there is a delay, then before allowing the ballot(s) to be cast, the issuance and casting at other locations must be checked. Each voting location, including mail processing, must confirm identity of the applying voter. The voting system will be no more secure against fraudulent and duplicate votes than the methods used to confirm identity of voters and verify uniqueness of ballot issuance. The polling location that has a book of only names and addresses of eligible voters is probably the least secure. Identity confirmation based on names and/or birthday and/or address are common methods. Any of these methods are actually not very secure. Internal processes at the polling station should preclude such a possibility of ballot theft or duplicate voting, but with collusion it is still very possible. 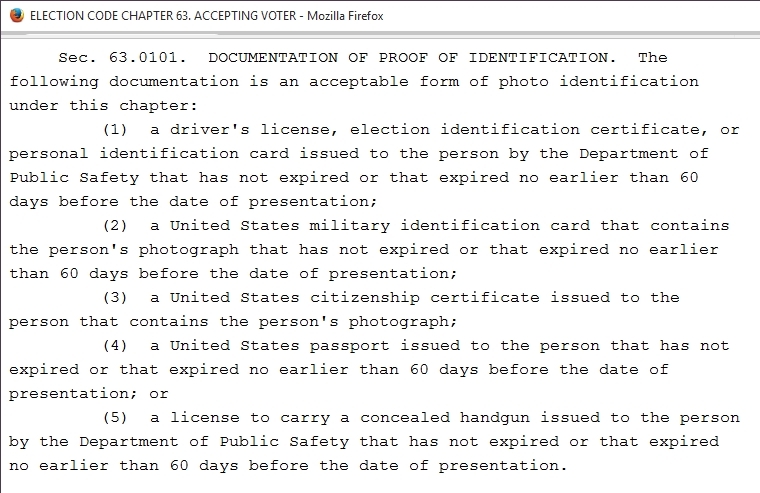 If no ID is required, any person can come up to a clerk and claim to a name in the open book without an indication that the voter already voted. In fact poll-workers can simply issue themselves or their confederates ballots in the names of any people that have not already voted. Part of the ballot issuance process, then, should include a method of leaving a trace by the voter that it was she and not someone simply claiming to be the voter that can be audited later. A signature of the voter might work. However, very few people are expert enough to recognize whether a signature is a forgery. No poll books have photos of voters – so comparing the person’s face to a photograph in the book would not work for identification. But taking a photo (as the trace) would be a change a substantial number of voters would object to. However, almost all voters have pictures on their driver licenses or other government-issued ID card. 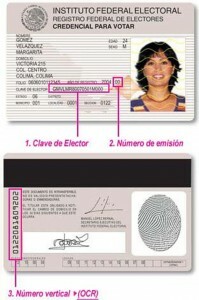 A poll-worker could take a photo of the ID card itself to act as trace that the voter appeared to get a ballot. Fingerprints, such as a thumbprint, are useful to establish a verifiable trace of the voter’s appearance at the polling station, but comparing fingerprints is probably a difficult job for ordinary poll-workers unless they’re aided by machinery. And where would the source print come from to compare to? Driver licenses are often issued by the state department of public safety or motor vehicles, who also take fingerprints as part of the licensing process. This government source of fingerprints would be a good one. Capturing biometric data at the time of registration and making it easy to verify at the time of issuing a ballot (or casting it) will add to the security and integrity of the voting system, but will also add some labor and storage needs for the data and the checking. Machinery to assist poll-workers in verifying could also add to the equipment cost of elections. 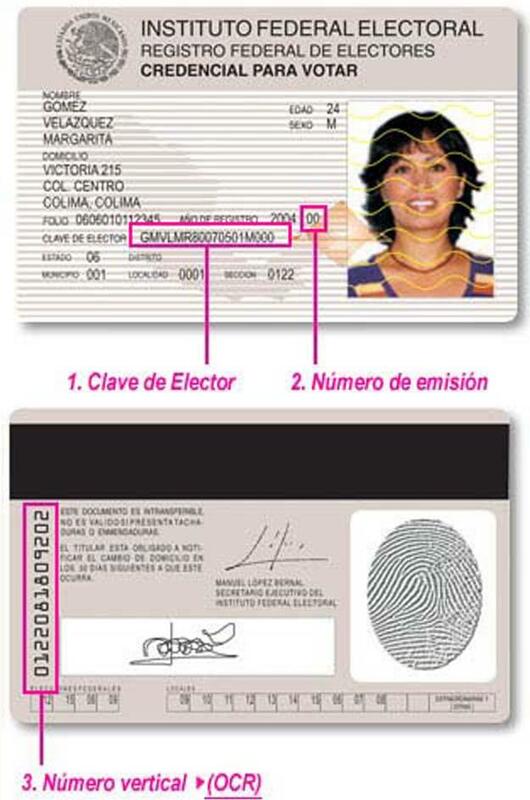 Clearly, verification of voter identity requires an ID card that provides some biometric data, such as a photo or fingerprint, that poll-workers can verify a voter’s identity. Further, the process must include capturing the same data at the time of ballot issuance and casting. If a foreigner visits NYC and pays sales tax on items he buys there, should he get a voter card there? If he is only visiting, he probably does not have more than a passing interest in who’s mayor or whether a sewer project is voted and funded by taxes and fees. However, if the NJ citizen who commutes in every workday has to pay taxes on his paycheck he earns in NYC, he probably wants to have a say in whether tunnel fees rise or a stadium is paid for by his taxes. That’s only fair. The same is true of a citizen who owns a second home, a dwelling he rents to others or property he simply pays real estate taxes on. He should have the right to say how those taxes are spent. While we’re sympathetic to the citizen who crosses a state line to buy goods that are cheaper or not available where he lives, we don’t think he should get a voter card for that situation, even though he pays sales tax. But why does the apartment-dwelling suburban homeowner have to choose between voting in the city or voting in the suburbs? Why does the real estate investor have no say over how his taxes are spent that are collected on his rental property? By requiring residence in the property even though real estate taxes are paid the government has disenfranchised the investor and second home owner. A citizen should have the right to vote in every jurisdiction where he lives and/or pays taxes. We need a Constitutional Amendment to assure this. We do need to limit this proposal with the notion we also adhere to “One Man, One Vote.” For example, suppose the suburban family owns a house in CT and a working parent of the family also owns an apartment in the city (NYC). Should the apartment dweller be able to vote in both NYC and suburban CT? Yes, but she or he gets only one vote in each distinct jurisdiction. So, in each city he or she gets a vote and in each state, but not 2 votes for President, since that violates the One-Man One-Vote principle. The voter must decide which is the principal residence and vote for President in that precinct only. When a voter is eligible to vote in more than one precinct because of her taxpayer or residence status, then any overlapping jurisdictions between the precincts have to be resolved to a single vote. If an investor owns 10 houses in 5 cities with 3 school districts, then she’ll get 5 city votes and 3 school board votes. 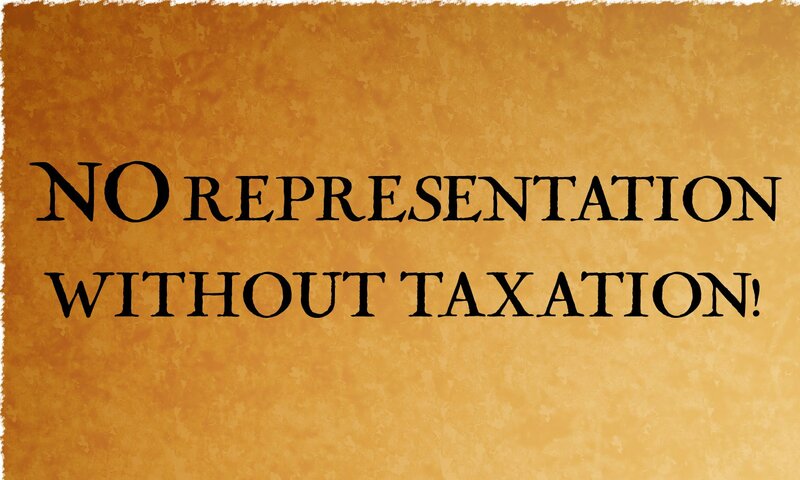 One does wonder, though, after due consideration, if “No Taxation without Representation” is a sound principle, is the converse also valid. If you pay no taxes, should you be able to vote to raise taxes on other citizens? This parapraxis actually captures the concept described above. 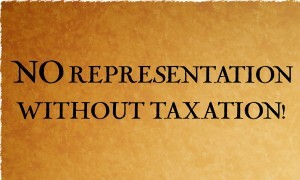 But since it generally disenfranchises people if they pay no taxes, we need to word any Constitutional limitation to cover the case where non-taxpayers are prohibited from setting tax rates or taxes for taxpayers. This might also include officials responsible for setting taxes and tax rates. If a person isn’t currently paying a particular tax, that person should not be able to increase taxes on those who are paying.